WASHINGTON (AP) - The mail-bomb scare widened Thursday as law enforcement officials seized three more suspicious packages - two addressed to former Vice President Joe Biden and one to actor Robert De Niro - and said they were similar to crude pipe bombs sent to former President Barack Obama, Hillary Clinton and CNN. None of the devices exploded, and no one was injured. But the packages, sent to prominent Democrats critical of President Donald Trump, heightened nationwide tensions and fears two weeks before major congressional midterm elections. Even as everyone condemned the unknown sender and Trump decried political violence, blame flew for the corrosive nature of America's political conversation. "A very big part of the Anger we see today in our society is caused by the purposely false and inaccurate reporting of the Mainstream Media that I refer to as Fake News," Trump said in a morning Tweet. "It has gotten so bad and hateful that it is beyond description. Mainstream Media must clean up its act, FAST!" Former CIA Director John Brennan, the target of one package sent to CNN where he has been a contributor, fired back. "Stop blaming others. Look in the mirror," Brennan tweeted. "Your inflammatory rhetoric, insults, lies, & encouragement of physical violence are disgraceful. Clean up your act....try to act Presidential." The politics belied the life-and-death nature of the growing list of bombing targets in New York, Delaware, Washington, D.C., Florida and California. Police on Thursday said the package recovered in Manhattan addressed to De Niro, who dropped an expletive insult at Trump at this year's Tony Awards, was similar to the other pipe bombs recovered this week. De Niro had also apologized to Canadians for the "idiotic behavior of my president." Biden has also criticized Trump, as recently as last week, saying Trump may not "know what he's doing" and coddles dictators. A law enforcement official said the packages addressed to Biden were intercepted at Delaware mail facilities in New Castle and Wilmington and were similar to the others. The official wasn't authorized to discuss an ongoing investigation publicly and spoke on condition of anonymity. Recovery of the packages to Biden and De Niro came after others were received by prominent Democrats and CNN. The first crude bomb to be discovered had been delivered Monday to the suburban New York compound of George Soros, a liberal billionaire and major contributor to Democratic causes. Soros has called Trump's presidency "dangerous." Similar packages addressed to Hillary Clinton and former President Barack Obama on their way to Chappaqua, New York, where Clinton lives with former President Bill Clinton and to Washington, where Obama lives with his wife, Michelle. The Secret Service said neither package reached their recipients. More were sent to frequent Trump critics Rep. Maxine Waters, D-California and former Attorney General Eric Holder. His ended up at the Florida office of Democratic Rep. Debbie Wasserman Schultz, who was listed as the return address. 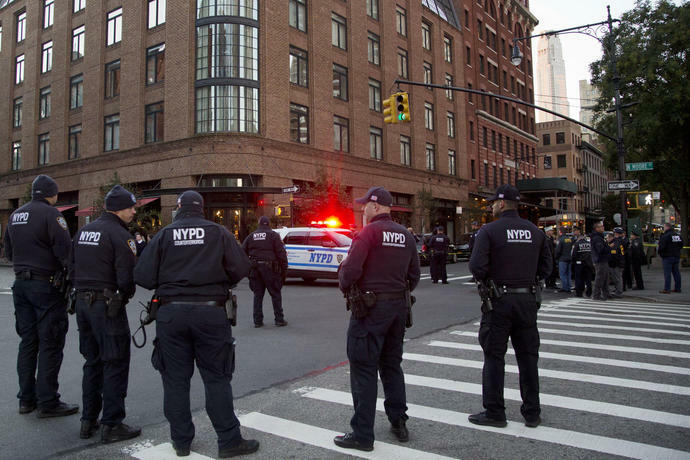 A police bomb squad removed the package addressed to Brennan from CNN's New York office, which was evacuated. The bombs seized Wednesday, each with a small battery, were about six inches long and packed with powder and broken glass, said a law enforcement official who viewed X-ray images and spoke on condition of anonymity to discuss an ongoing investigation. The official said the devices were made from PVC pipe and covered with black tape. The devices all were sent to an FBI lab in Virginia to be studied. Officials provided no details on a possible suspect or motive. "Suffice it to say, it appears an individual or individuals sent out multiple, similar packages," said John Miller, the New York Police Department's head of intelligence and counterterrorism, who briefed reporters. As the scope of the attack became clearer Wednesday, Trump decried political violence during a scripted event in the White House East Room and other members of the administration said it has no place in American society. Later at a rally in Wisconsin, he urged unity. "Let's get along," he said. "By the way, do you see how nice I'm behaving tonight? Have you ever seen this?" But at the same event, he blamed the media and on Twitter Thursday kept up the argument that the media plays a role. "Acts or threats of political violence have no place in the United States," Trump said. "This egregious conduct is abhorrent." Other Republican leaders said the same. But Democratic Senate and House leaders Chuck Schumer of New York and Nancy Pelosi of California said such words "ring hollow" when coming from Trump. They noted the president's recent praise of a GOP congressman who body-slammed a reporter, among other Trump statements. Sisak reported from New York. Associated Press writers Colleen Long, Ken Thomas, Jill Colvin and Chad Day in Washington and Jim Mustian, Deepti Hajela and Tom Hays in New York contributed to this report.